Water Safe Swim School adds even more fun into their swim classes! Bubble Rollers can serve as an aid to remove fear of water for beginner swim students. Before placing them in water, why not allow them to cozy up to the pool by placing the child into a bubble roller and play around for a while. After a few minutes, the student will be having a blast, as they crawl, paddle, and roll around in these amazing mobile rubber balls. Give it a shot! Visit our site for information on booking attractions with Emerald Events. Blue Buoy Swim School orders Bubble Rollers for students. Every child will eventually need a swim lesson. While being introduced to the pool for the first time, they may feel slightly uncomfortable with the elements around them. Try placing the child in a Bubble Roller to feel more relaxed. Bubble Rollers are awesome for introducing first timers to the pool. Parents from the City of Corona found a way to keep their children cool during the hot summer. When all else fails, The Bubble Rollers will save the day! With temperatures rising well over a hundred degrees, why not take the kids out and have some family fun and splash around in a pool and have a bubble rollin’ goodtime! Roll ‘N Fun Zone is having their grand opening today! Load up the family car, come on down and join in the fun! R ‘N F Zone is the #1 kids indoor attraction in town. Located in Redondo Beach at the South Bay Galleria Mall! Offering land bubble rollers, arcade games, paddle rollers, as well as, birthday party rooms. Refreshments will be offered so, load up the family car, come on down and join in the fun! All kids love attending carnivals, no matter the size. Gissler School thought it would be a great idea to hold a fundraiser by asking Emerald Events to help with providing the attractions. We set up the Task force laser tag as one of the main attractions. In addition, Land Zorbs were placed directly next to Laser Task Force fun. Laser tag mobile attractions are exciting for any event. Day or night, indoor or outdoor, birthday or large carnival! Emerald Events party packages are customized to fit your needs. Our laser guns works great, day or night. Our team members can construct an arena in your backyard or local park. Laser Tag is a fun and healthy party activity for everyone to enjoy! Great for ALL ages! Visit our site for information on booking children’s attractions. Arroyo School kicked off their carnival with a large Jungle Obstacle Course last week. In addition, Three large land Bubble Rollers were part of the attraction. Children jumped their hearts content throughout the day. 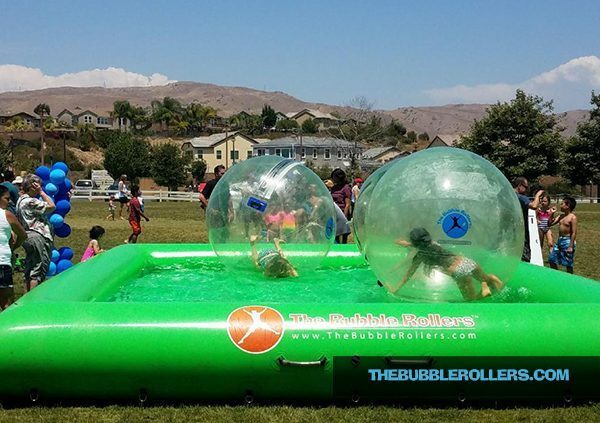 As they found their way through the obstacle course, they wound up walking into the large Land Bubble Rollers. Children rushed to stand in line to have their turn in each Land Bubble Roller. As they whisked away, you could hear the giggling, and screaming while Land Bubble Rollers took them for the ride of their lives. The excitement on the children’s faces were priceless! You just had to be there. The joy, laughter, and bonding among the student will be memorable. All of the main attractions were provided by Emerald Events. One of our newest attractions is quite the adventure. Our Jungle Themed Interactive Obstacle course is one of a kind and great for kids parties, school events, carnivals and more. To learn more about sizing and pricing please feel free to contact us. The Radical Run Obstacle Course and three large Land Bubble Rollers magically appeared at Hewes Middle School. This is the kind of day students look forward to after a long day of studies and receiving high marks! Indeed, the obstacle course was a hit! The staff would here at Emerald Events would like to give a big thumbs up to the students who enjoyed the attractions! We hope to see you again in the future kiddos! Our 95′ Radical Run Obstacle Course and Interactives are extremely popular. The Radical Run Obstacle Course is an interactive game that is easy to transport, and fits in with any size events. This obstacle course is packed with features like pop-ups, a log jam, squeeze wall, crawl through obstacles, climbing walls, and up and over slides. Kids and adults both love this attraction. Includes all of our standard game features and is available in smaller sections for smaller events or areas. The Long Beach Irish Fair 2017 is coming to Long Beach, Ca. We all know the Irish enjoy a great party, especially, when food , drinks, and entertainment is center stage. Last years celebration was wonderful, but this year, it’s going to be incredible! Why hang out in a pub when you can enjoy an entire weekend in the park? Grab the kids, family, friends, then load up the car and plan for a fun-filled weekend of non-stop entertainment. Come on down and enjoy the food, music, and attractions. 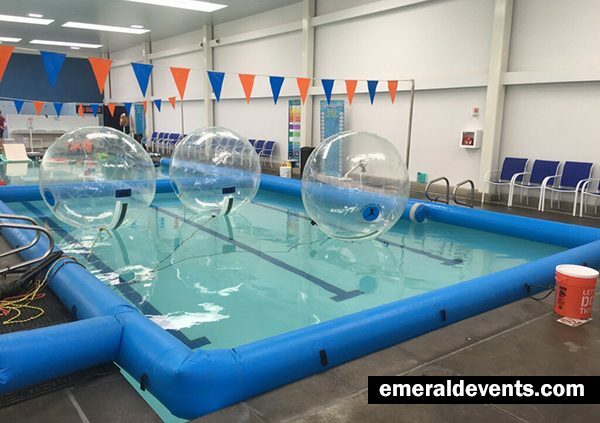 Of course, Emerald Events will be there to provide the bungee, land bubble rollers, obstacle course, and inflatable shooting range! Still not convinced? Then, check out the scheduled events taking place throughout the weekend! The Irish Fair is guaranteed to be a hit! Buy your tickets online now or pay upon entry. See you there! Visit our site for information on booking children’s attractions and party rentals. Arriana & Arman Enjoys Laser Tag Birthday! Laser Tag anyone? Arianna’s and Armaan’s celebrate their 12-year birthday. Luckily, the staff at Emerald Events was there to provide and set up the laser equipment. The twins parents planned a wonderful day for this pair of teenagers. With the equipment set up and ready to go, attendees huddled as teams were divided in two. Lasers guns then distributed among each player. What a wonderful sight to see! Parents cheered on the sidelines as the games took place. As a result, they also joined in the fun. Exhausted from the fun, everyone headed to the photo booth. Not only, did Arianna and Armaan’s parents think of the fun with Laser Tag but they remembered the photo booth to seal the memories among friends. What is Task Force Laser Tag? http://emeraldevents.com/wp-content/uploads/2017/01/mobile-laser-tag-4.jpg 720 1280 Emeraldstaff http://emeraldevents.com/wp-content/uploads/2017/01/emerald_events_logo-1.png Emeraldstaff2017-06-08 08:00:002017-06-08 15:51:48Arriana & Arman Enjoys Laser Tag Birthday! Casper’s parents planned a memorable day. They contacted Emerald Events to provide party equipment for the festivities. Their son Casper will be celebrating his first birthday today! In just a few hours, Land Bubble Rollers will be arriving and rolling it’s way into everyone’s heart. Once the attractions arrive, we expect rave reviews from every birthday attendee, directly after. All of our staff at Emerald Events would like to extend Casper a very Happy Birthday! Every birthday is considered to be a very special occasion. Which is why we go above and beyond the call of duty when planning an event for our customers. While planning events, we expect the eyes of children to light up with excitement. As well as, adrenaline reaching maximum levels. Land Bubble Rollers are one of our top sellers and a great party attraction for any event. Adults, teen, and children of all ages will be entertained as they race, bump around, and have free-for-all matches in the arena. We offer safety nets to provide a safe environment filled with fun-filled amusement and laughter. If looking for a way to provide family-fun entertainment, Emerald Events is the way to go! In addition, we provide a vast amount of party attraction supplies so no event will ever be a flop.